The most interesting thing about Ikat Jasmine is its name. Ikat is an elaborate resist-dyeing and weaving technique in which rather than dyeing the finished, woven fabric - the individual threads or bundles of yarn are tightly tied or resistance-treated before being dipped in the dye, and only then woven into elaborate patterns that (unlike printing a pattern) are visible on both sides of the fabrics. This is an ancient technique that is labour-intensive and requires both skill and artistry. It is extremely difficult to create accurate patterns with the pre-dyed yarn, especially when trying to create elaborate designs with multiple colours. Therefore there is always a blurry quality to it - which adds to its charm and character. Ikat fabrics made with finer threads (such as silk) and several colours require an expert weaver, and usually are more accurate and costly. In many of the cultures where Ikat is produced, the fabric is considered to possess magical powers, endow its wearer with good luck, or at least be a symbol of status. 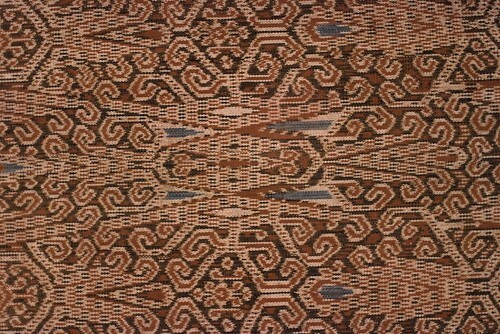 The technique can be found among specific weaving traditions, all over the world: Central Asia, Southeast Asia, India, Japan, Africa and the Andes indigenous people of South America. Most of these cultures use either a warp or weft ikat; while only very specific locations produce the even more elaborate double ikat, in which both the warp AND the weft are resist-dyed, for example: India (Pochampally Saree from the Bhoodan Pochampally village in Telengana State; and Puttakapa Saree from the Puttakapa village in Andhra Pradesh). The Balinese village Tengan (Indonesia) produces the beautiful geringsing; and in Okinawa, Japan (where it is called tate-yoko gasuri). In Okinawa there is an additional uniquely Japanese ikat technique called Oshima, which is used for stiff fabric and is so labour intense it is reserved for royalty). Reading up about it was probably the best thing that came out of this short-lived perfume experience. I now have an even greater appreciation for the art of weaving. But also am more disappointed of this perfume, whose only connection to its name is its blurry, nondescript quality. However, while the blurriness of an ikat fabric shows its handmade origin and gives it a one-of-a-kind value - Ikat Jasmine perfume smells impersonal, industrial, synthetic and showcases neither jasmine nor ikat-like craftsmanship in its design and execution. To begin with, its only resemblance to jasmine is to star jasmine, which is not a true jasmine at all. In other words - there is no indole and no other dirty secrets to discover. In addition, there are absolutely no fun surprises of twists-of-plot for this number. From a nondescript floral frolic it smoothly and stretches into a yawn-inducing musky-ambery vagueness. To be fair, it is a pretty and wearable whitish floral ambery-musky thing, and all in all not bad if you place it next to, say, Halle Berry Exotic Jasmine. But compare it to what true jasmine absolute smells like or one of the more successful renditions of the theme (Jasmin de Nuit, Jasmine Rouge and A La Nuit), not to mention something a tad more imaginative such as Alien - it hardly demands mentioning. Another point of reference is the price: for $125 CAD plus tax, you can do better than that: Either save yourself $26 and get Pure Poison, which is basically the same thing (minus pretending it's a high quality jasmine fragrance) add $25 more and get A La Nuit by Serge Lutens, both available at Sephora on Robson Street (for some reason they don't have the Serge Lutens on their website). To be fair, though, it is so much better than California Star Jasmine by Pacifica. Like, 100 times better. But that says more about Pacifica's disappointing launch rather than the topic of this blog post. The notes are supposedly Tuberose Fleur, Jasmine Sambac, Jasmine Egypt Infusion, Honeysuckle, Tuberose Infusion. What my nose is smelling is Star jasmine, orange blossom, white musk and a hint of powdery, sheer amber.